23 April is a symbolic date for world literature, since 23 April 1616 was the date of death of Cervantes, Shakespeare and Inca Garcilaso de la Vega. 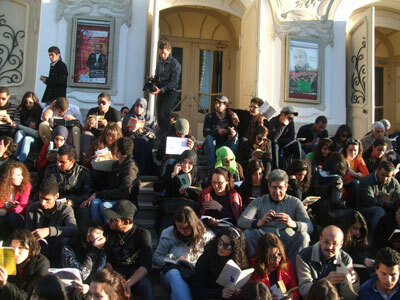 23 April is also the date of birth or death of other prominent authors such as Maurice Druon, K.Laxness, Vladimir Nabokov, Josep Pla and Manuel Mejía Vallejo.This year, Tunis lit the candle for UNESCO’s World Book Day. The theme of this year’s book day is translation. Since 1979, UNESCO member states have logged more than 2 million translations in their translation index, which is available online. Five days before the annual UNESCO-sponsored World Book and Copyright Day, hundreds of Tunisian readers took over iconic Habib Bourguiba Avenue with an event called “L’avenue taqra” or “The avenue reads.” Children and adults sat in cafes, on steps, and on the sidewalks to read a variety of books. As the day wore on, many held candles in order to continue reading into the night. The invitation to the April 18th event in Tunis explained that everyone would bring their own books or magazines to cafés or other public places where they would sit and read silently together for an hour.” Nas Décaméron, an artistic and literary group based at Ibn Khaldoun Cultural Centre in Tunis called for the initiative. 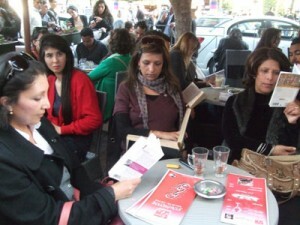 It also organises a salon every week to discuss a world novel. 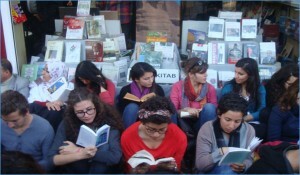 The group’s Kamel Riyahi headed the “Read” initiative. According to a 2010 Tunisian reading survey, more than 20% of respondents hadn’t read a book in their entire life and of those who did read, 60% read fewer than five books per year. In Cairo, Shorouk Bookstores is offering the best WB & CD discount, at 20%, but other stores (BookSpot), chains (Alef), and government entities (GEBO) are also offering money-off deals. The Cervantes Institute in Dokki (Cairo) today offers readings of Cervantes’ “Don Quixote” in its original Spanish and in Arabic translation. The novel will be read continuously from noon until 7:45 pm. In Sharjah or Dubai, the children’s reading festival opened today. 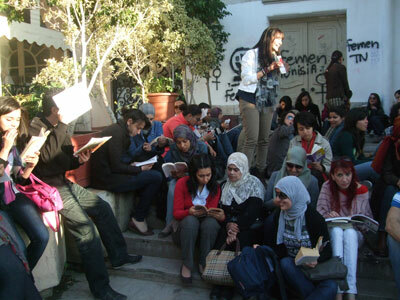 Moroccans are going to read books before the parliament. The theme is: “Culture in the face of absurdity.” If you’re in Lebanon, Antoine Bookstore is having an exhibition of Spanish books and books about Spain in collaboration with Cervantes Institute in Downtown Beirut. A Wonderful action. Share books, share knowledge and share joy… Keep reading freinds! Reading skills are essential to success in society today the ability to read is highly valued and very important for social and economic advancement.Instilling reading into a child’s life can prove to be one of the most valuable skills that they will ever learn. As a result from reading books, the child will be more likely to read and speak in front of people.